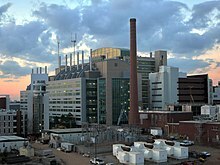 DeKalb County (/dəˈkæb/ də-KAB) is a county in the U.S. state of Georgia. As of the 2010 census, the population was 691,893, making it Georgia's fourth-most populous county. Its county seat is Decatur. DeKalb County is included in the Atlanta-Sandy Springs-Roswell, GA Metropolitan Statistical Area. It contains roughly 10% of the city of Atlanta (the other 90% lies in Fulton County). It is Georgia's most diverse county. DeKalb is primarily a suburban county, and is the second-most-affluent county with an African-American majority in the United States, behind Prince George's County, Maryland, in suburban Washington, D.C. In recent years, some communities in North DeKalb have incorporated, following a trend in other suburban areas around Metro Atlanta. Dunwoody and Brookhaven are now the largest cities entirely within the county. DeKalb County, formed in 1822 from Henry, Gwinnett and Fayette counties, took its name from Baron Johann de Kalb (1721-1780), a Bavarian-born former officer in the French Army, who fought for the Continental Army in the American Revolutionary War. The oldest existing house in the county is the 1831 Goodwin House along Peachtree Road in Brookhaven. In 1853, Fulton County formed from the western half of DeKalb, divided along a perfectly straight and due north/south line down the middle (along which Moreland Avenue now runs). Until this time, the growing city of Atlanta had been inside DeKalb. Atlanta grew because the city of Decatur did not want to become the railroad terminus in the 1830s, thus a spot at the Thrasherville encampment in western DeKalb was picked to become Terminus and then Marthasville, before becoming Atlanta a few years after its founding. North and southwest Fulton came from two other counties: Milton and southeast Campbell, respectively. DeKalb once extended slightly further north to the Chattahoochee River, but this strip was later given to Milton, and is now the panhandle of Sandy Springs (though residents there identify with Dunwoody). During the Civil War, much of the Battle of Atlanta took place in DeKalb. Until the 1960s, DeKalb was a mainly agricultural county, but as the sprawl of the metropolitan Atlanta region expanded, DeKalb became increasingly urbanized. Finished in 1969, the eastern half of the Interstate 285 beltway, called "the Perimeter", ringed the northeastern and southern edges of the county, placing most of it "inside the Perimeter" along with nearly all of Atlanta. Interstate 675 and Georgia 400 were originally planned to connect inside the Perimeter, along with the Stone Mountain Freeway (U.S. Highway 78) connecting with the Downtown Connector (a co-signment of I-75/I-85) near Moreland Avenue, destroying many neighborhoods in western DeKalb, but community opposition in the early 1970s spared them this fate of urbanization, although part of the proposed Stone Mountain Tollway later became the Freedom Parkway. Only Interstate 20 and Interstate 85 were successfully built through the county. DeKalb also became one of only two counties to approve MARTA rapid transit in the 1970s; the county now contains the east and northeast heavy rail lines. In April 2018, more than 350 bus drivers for DeKalb County School District went on strike over low pay and poor working conditions, resulting in seven bus drivers being fired. In recent years, along with many other counties in the Atlanta area, DeKalb County has voted strongly Democratic in presidential elections, while in the past it was more of a swing county, voting Democratic and Republican an equal number of times from 1960 until 1988. In the wake of the United States elections, 2018, it no longer has any Republican representatives in the state legislature or United States House of Representatives, for the first time since the breakdown of the old Solid South. The current Chief Executive Officer of DeKalb County is Michael Thurmond. He took office on January 1, 2017. Unincorporated DeKalb County is policed by the DeKalb County Police Department, the DeKalb Sheriff's Office, which is responsible for serving criminal warrants and securing the courts and county jail, and the DeKalb Marshal's Office, which serves civil processes issued through state court, such as evictions. Fire services are provided throughout the county by DeKalb County Fire and Rescue. Previously, DeKalb County Fire and Rescue also provided emergency medical services throughout the county; however, in 2013, DeKalb County signed a contract with American Medical Response to provide emergency medical services to the county. The Centers for Disease Control and Prevention is based in the Druid Hills CDP in an unincorporated area in the county. The Federal Bureau of Investigation Atlanta Field Office is located in Chamblee. The Metro State Prison of the Georgia Department of Corrections was formerly located in an unincorporated area in DeKalb County. Female death row inmates (UDS, "under death sentence") resided in the Metro State Prison. The prison was closed in 2011. According to the U.S. Census Bureau, the county has a total area of 271 square miles (700 km2), of which 268 square miles (690 km2) is land and 3.6 square miles (9.3 km2) (1.3%) is water. The county is crossed by the South River and numerous creeks, including Nancy Creek, Snapfinger Creek and two forks of Peachtree Creek. Peachtree Creek and Nancy Creek drain into the Chattahoochee River and eventually to the Gulf of Mexico. South River drains into the Ocmulgee River and ultimately into the Atlantic Ocean. The southern two-thirds of DeKalb County, in a line from Druid Hills northeast to Tucker, is located in the Upper Ocmulgee River sub-basin of the Altamaha River basin, while the portion of the county north of that line is located in the Upper Chattahoochee River sub-basin of the ACF River Basin (Apalachicola-Chattahoochee-Flint River Basin). As of the 2010 United States Census, there were 691,893 people, 271,809 households, and 161,453 families residing in the county. The population density was 2,585.7 inhabitants per square mile (998.3/km2). There were 304,968 housing units at an average density of 1,139.7 per square mile (440.0/km2). The racial makeup of the county was 54.3% black or African American, 33.26% white, 5.12% Asian, 0.4% American Indian, 4.5% from other races, and 2.39% from two or more races. Those of Hispanic or Latino origin made up 9.8% of the population. In terms of ancestry, 5.9% were English, 5.2% were German, and 3.5% were American. Of the 271,809 households, 32.6% had children under the age of 18 living with them, 35.8% were married couples living together, 18.3% had a female householder with no husband present, 40.6% were non-families, and 31.4% of all households were made up of individuals. The average household size was 2.50 and the average family size was 3.18. The median age was 34.3 years. The median income for a household in the county was $51,349 and the median income for a family was $60,718. Males had a median income of $43,663 versus $40,288 for females. The per capita income for the county was $28,412. About 12.4% of families and 16.1% of the population were below the poverty line, including 24.2% of those under age 18 and 11.2% of those age 65 or over. Although Fulton County is more populous, DeKalb has the highest population density of any county in the Atlanta metropolitan area. The Consulate-General of Mexico in Atlanta is located in the North Druid Hills CDP. The Consulate-General of Guatemala in Atlanta is located in the North Atlanta CDP. The Consulate-General of Peru in Atlanta is located in an unincorporated section of DeKalb County. Xpress GA / RTA commuter buses and MARTA heavy rail subway and buses serve the county. Currently, there are plans for the construction of a multi-use trail, known as the Peachtree Creek Greenway. The goal of the greenway is to provide residents with close-to-home and close-to-work access to bicycle and pedestrian trails, serve transportation and recreation needs, and help encourage quality of life and sustainable economic growth. The trail will connect the cities of Atlanta, Brookhaven, Chamblee and Doraville. The portion of DeKalb County not within the city of Atlanta or the city of Decatur is served by DeKalb County School District (formerly DeKalb County School System). The Atlanta portion is served by Atlanta Public Schools. The Decatur portion is served by Decatur City School District. On December 17, 2012, the Southern Association of Colleges and Schools announced that it had downgraded the DeKalb County Schools System's status from "on advisement" to "on probation" and warned the school system that the loss of their accreditation was "imminent." From its opening in 1990 until 2003, the Seigakuin Atlanta International School was located on the property of Oglethorpe University in Brookhaven, an unincorporated area. Agnes Scott College is a private, all female, undergraduate liberal arts college in Decatur. Emory University is a private, coeducational, liberal arts university. It is a member of the Association of American Universities, an association of leading research universities in the US and Canada. The university consists of the following divisions: Emory College of Arts and Science, the Laney Graduate School, Candler School of Theology, Goizueta Business School, Emory University School of Law, Rollins School of Public Health, and the Nell Hodgson Woodruff School of Nursing. Mercer University is a private, coeducational, faith-based university with a Baptist heritage. Its main campus is in Macon. The Cecil B. Day Graduate and Professional Campus is in DeKalb County; it houses the College of Nursing, the College of Pharmacy and Health Sciences, and the James and Carolyn McAfee School of Theology along with programs of the Eugene W. Stetson School of Business and Economics, the School of Medicine, and the Tift College of Education. Oglethorpe University is a private, coeducational, liberal arts school in Brookhaven and is named after James Oglethorpe, founder of the Georgia Colony. Georgia Perimeter College (formerly DeKalb College) has three campuses within the county and offers two-year associate degrees. Georgia Piedmont Technical College (formerly DeKalb Technical College) is the largest vocational institution in Georgia. Georgia Piedmont Technical College trains students in business, engineering, technologies, health, human services, industrial arts, information systems, and transportation. DeVry University offers bachelor's and master's degrees in healthcare, accounting, business, and management technology. Columbia Theological Seminary is a theological institution of the Presbyterian Church (USA) in Decatur. More than 640 students are enrolled at Columbia in one of five degree programs: Master of Divinity, Master of Arts in Theological Studies, Master of Theology, Doctor of Ministry, and Doctor of Theology. Luther Rice College and Seminary is a private Christian college and seminary in Lithonia. It offers bachelors, masters, and doctoral programs in ministry and ministry-related programs. The DeKalb County Public Library has 22 branches throughout the county. The DeKalb County 9/11 Memorial was dedicated on September 11, 2011. U.S. Marine and sculptor Curtis James Miller designed a memorial that is located in front of the Dekalb County Fire and Police Headquarters. The memorial pays homage to the 343 New York Firefighters, 60 New York and Port Authority Police Officers and the more than 2800 civilian victims of the terrorist attacks in New York, Washington, D.C. and Shanksville, Pennsylvania on September 11, 2001. A piece of steel from one of the World Trade Center Towers in New York City is the centerpiece of this monument. ^ Wilson, Lori (April 20, 2018). "At least 7 bus drivers fired over DeKalb schools 'sick out'". WSB-TV. Cox Media Group. Retrieved May 2, 2018. ^ Dave Leip's Atlas of U.S. Presidential Elections. ^ "DeKalb - Election Results". results.enr.clarityelections.com. ^ "DeKalb County Sheriff Office". Dekalbsheriff.org. Retrieved 2012-12-22. ^ "DeKalb County fire & Rescue". Web.co.dekalb.ga.us. 2005-04-01. Archived from the original on 2012-10-27. Retrieved 2012-12-22. ^ "DeKalb keeps sanitation rates and service". Dunwoody Crier. ^ "Druid Hills CDP, GA Archived November 25, 2011, at the Wayback Machine." United States Census Bureau. Retrieved on May 5, 2009. ^ "Atlanta Division." Federal Bureau of Investigation. Retrieved on June 9, 2015. "2635 Century Parkway N.E., Suite 400 Atlanta, GA 30345"
^ "City of Chamblee Street Map" (Archive). City of Chamblee. Retrieved on June 9, 2015. ^ "Metro State Prison Archived May 23, 2010, at the Wayback Machine." Georgia Department of Corrections. Retrieved on July 18, 2010. ^ "Inmates Under Death Sentence January 1, 2010 Changes to UDS Population During 2009[permanent dead link]." Georgia Department of Corrections. 3/7. Retrieved on July 18, 2010. ^ Cook, Rhonda. "State closed DeKalb County prison." Atlanta Journal-Constitution. Friday April 1, 2011. Retrieved on November 18, 2012. ^ a b "A Major Employer". Archived from the original on 2013-12-12. ^ "Contact Us Archived 2009-04-22 at the Wayback Machine." Kroger. Retrieved on April 30, 2009. ^ "North Druid Hills CDP, GA[permanent dead link]." United States Census Bureau. Retrieved on May 5, 2009. ^ "Consulates Archived 2008-12-21 at the Wayback Machine." Georgia Department of Economic Development. Accessed October 26, 2008. ^ "North Atlanta CDP, GA[permanent dead link]." United States Census Bureau. Retrieved on May 5, 2009. ^ "Atlanta Archived 2008-10-06 at the Wayback Machine." Consulado General del Peru. Accessed October 26, 2008. ^ "DeKalb school district in 'conflict and crisis,' put on probation by accreditation agency". The Atlanta Journal and Constitution. December 17, 2012. Retrieved December 19, 2012. ^ Home. Atlanta Jewish Academy. Retrieved on June 1, 2017. "Lower School 5200 Northland Drive Atlanta, GA 30342" and "Upper School 3130 Raymond Drive Atlanta, GA 30340"
^ "Zoning Map." City of Doraville. September 6, 2016. Retrieved on June 1, 2017. ^ "Contact Us." Mohammed Schools. Retrieved on September 28, 2011. "735 Fayetteville Road, Atlanta, Georgia 30316"
^ "History Archived November 4, 2005, at the Wayback Machine." Seigakuin Atlanta International School. Retrieved on January 11, 2012. ^ "Georgia Piedmont Technical College – Georgia Piedmont Tech is one of Georgia's oldest and most respected technical colleges". www.gptc.edu. ^ "Hike, Bike, Historic - Arabia Mountain National Heritage Area". ^ "Stone Mountain Theme Park - Atlanta Attractions & Events". ^ "Fernbank Museum of Natural History - Atlanta, GA". ^ "Fernbank Science Center...Where Science Becomes an Adventure". ^ "Emory - Michael C. Carlos Museum". ^ "Home - Callanwolde Fine Arts Center". Callanwolde. Wikimedia Commons has media related to DeKalb County, Georgia. ^ "Board of Commissioners - DeKalb County, GA". www.dekalbcountyga.gov.